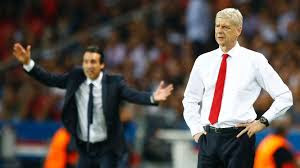 Different people have continued to make comparisons between the era of Arsene Wenger and that of Unai Emery and so far, their views all seem to suggest one thing which is that the latter is more flexible in approach. Alexandre Lacazette at a time confessed that he feels better under the new boss because he allows him to do his thing freely unlike in the past when he had to act by fixed instructions. A member of the Arsenal backroom staff, Darren Burgess, has followed suit by analysing the variations in training sessions organised by the duo. The Director of High Performance who has plied his trade under predecessor and successor said that Emery holds training in bits to tackle problems in various areas while Wenger's sessions were handled as a whole. Arsenal will be in action again on Monday night after securing a 2-0 win over Napoli in the first leg of the Europa League quarter-final three days ago. They will play Watford in a bid to return to fourth following their crash from Champions League qualification zone due to the Everton loss in the last Premier League game.